Our delicious bark starts with a dark chocolatey base that's topped with "Home-Cooked" salted Virginia peanuts, salted jumbo cashews, salted almonds, and caramel bits and then finished with a decadent white chocolatey and peanut butter drizzle. Ingredients: Chocolatey Coating (Sugar, Vegetable Oil (Palm Kernel Oil, Hydrogenated Palm Kernel, and Cottonseed Oils), Nonfat Dry Milk, Cocoa Processed with Alkali, Cocoa, Partially Defattened Peanut Flour, Glyceryl Lacto Esters of Fatty Acids, Peanut Oil, Salt, Soy Lecithin), Peanuts, Cashews, Almonds, Caramel Bits (Sugar, Corn Syrup, Liquid Sugar, Skim Milk, Palm Oil, Butter (Cream, Salt), Salt, Mono- and Diglycerides, Soy Lecithin), Vegetable Oil (Contains one or more of: Coconut, Peanut, Cottonseed, or Canola Oil), Salt. Contains: Peanuts, Almonds, Cashews, Milk and Soy. The Best Chocolate Candy I've ever had!! OMG, This is the Best Chocolate Candy I've ever had!! I got a free sample when I ordered some Virginia Peanuts. 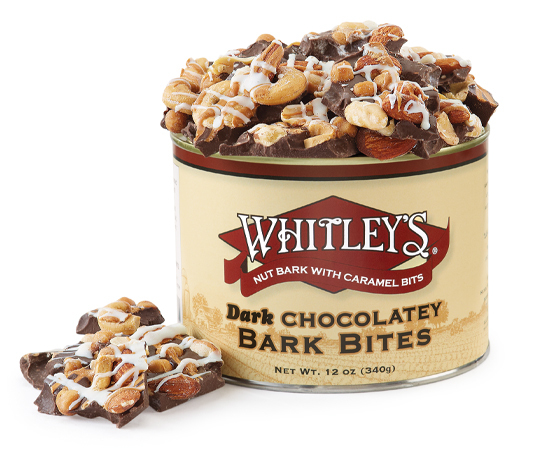 After I tasted the Chocolate Bark, I ordered two more tins. We received this as a gift and have enjoyed everything!